Today’s post is written by the lovely Attika who shares her tips on travelling as a new mum. She blogs and writes over at Forever17mag so go check her out and connect with her on Facebook. bit if you are travelling with a baby. Yes, you heard me right! go wrong in your city, travelling to a distant location with a baby requires a lot of homework. No, I am not scaring you. Unwanted incidents can happen anywhere around the globe. You can lose your credit card or even your suitcase. But with a baby on board, you need to be careful with your decisions for an enjoyable journey. Travel light is what you hear again and again. I would rather rephrase and say travel smart. If you are going for a week, you know you don’t need to carry 12 shirts and eight pairs of jeans. Remember, you should buy a shirt or two, and you can use that too. Also, check the weather before reaching your destination. You might require an overcoat or jacket for yourself and similar extra layers for the baby. So once you are done packing your essentials that I am not supposed to talk about (I am expecting you have travelled before and are expecting some baby-related advice), move towards the baby to-do list. When travelling with a baby, don’t forget to carry his ‘various types’ of clothes. Whether it is a girl or a boy, keep nightdresses, onesies, two pieces, vests and underwear. Also, add in a swimming costume and swimming pants. Carry a good amount of diapers (6 per day) and few extras for emergency poop (diarrhoea) days. You may hear someone say you can get it from your travel destination, but it is better to carry a little weight than get into the hassle of locating shops and bombard yourself with an unnecessary mess. Take a packet of wipes with you. 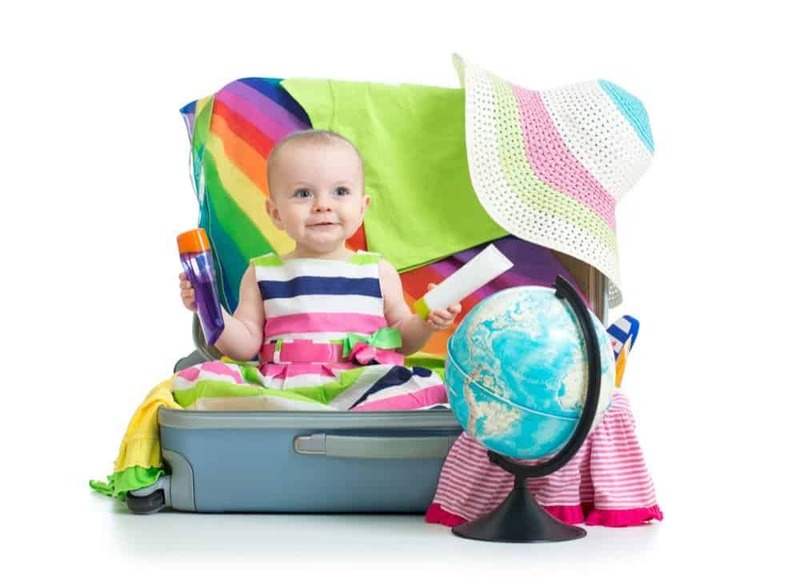 You can have a travel pack separately placed in your baby bag. Interestingly, I would advise you to carry the baby bag during the flight and keep your handbag/purse in the suitcase; as I said, travel smart. While you prepare your toiletries and medicines, keep a separate pouch for your baby’s essential. There should be a grooming kit having his hairbrush, toothbrush, toothpaste, nail cutter, lotion and a shampoo/soap. Don’t forget to add in his diaper rash cream. Keep a separate pouch for his medicines that you will need it during the flight and the entire journey. Keep a painkiller; ear drops, teething tablets and an anti-allergy. Along with the medicine pouch, your in-flight baby bag should have an extra pair of baby clothes, a nursing cover, diapers, wipes, rattles, snacks and your own spare dress. Carry a stroller with you and make sure you get a separate cot in the hotel room. Flying may be difficult, but try to make the child sleep while you land to avoid their yanking shrieks. choose a destination with relatives present around. Leaving the baby with them or even opting for a daycare service at your hotel is your chance to enjoy the trip as a bachelor (I know you will worry what your child is doing back home). Do not hesitate to go on a vacation because of a baby. Remember, you need some time off, away from the worries of a daily routine. Babies always behave well when they are at a new, lively place. Recall the last time you took him to the zoo. He was silent and observant. That is how he will be while on vacation. And even if something goes wrong, you are a mom; you will know how to handle it. Great tips! Another one I’d like to add is start ‘em young when it comes to traveling – Alhamdulillah our little one went on his first flight at 9 months old and now at 2 and a half, he behaves very well on long-haul flights.